The following diagram represents the ZenZone methodology behind our vision. Each element is also explained in further detail in the links below. 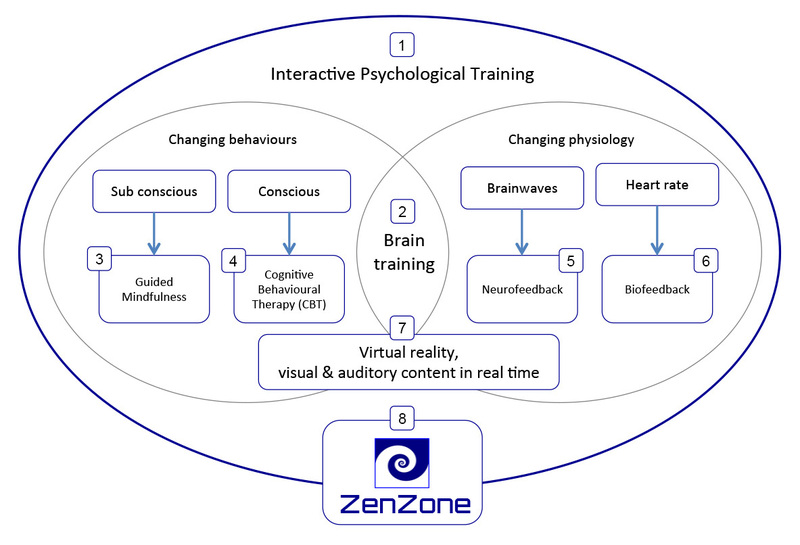 Interactive Psychological Training best describes ZenZone's unique approach to the subject of Brain Training. It is the combination of a variety of methods to changing behaviours and physiology both consciously and sub-consciously. With the addition of the bodies feedback loop and delivered through a computer or mobile device, this combination forms a very powerful approach to enhancing your Brain Fitness. To date, much of the broader brain fitness industry has been focussed around providing brain training solutions that encourage the repetition of eyes open, conscious mental tasks, challenges and exercises (like Sudoku or memory games). However there is varying evidence that this approach makes a brain 'fitter'. In this section we aim to set out exactly what we mean by 'Brain Training' and our approach to it. Brain Training is a rapidly growing and new area of Neuroscience that reflects the hypothesis that cognitive abilities can be maintained or improved through exercising the mind. Despite the various demands of life like stress, anxiety, depression and ageing, certain aspects of the brain and it's structure have been shown to continue to adapt and change through-out our lives with higher levels of mental activity. The function of Brain Training therefore is that it is intended to exercise the brain - much like a muscle would be exercised and strengthened. Brain Training is gaining in popularity as a way to try and address various mental health challenges. It is also seen as a way to boost personal cognitive skills like stress management, the ability to learn, focus attention and improve concentration. Essentially, at ZenZone we believe that Brain Training is trying to help an individual to consciously and sub-consciously change their behaviours and/or their physiology in order to improve mental performance, capacity and capabilities. Our belief is that by including the bodies feedback in a brain training routine, an individual is also able to become consciously aware of their progress and is able to monitor and adjust their activity for improved results. Guided Mindfulness Meditation (GMM) is a form of meditation where an individual is verbally guided into a state of consciousness by a person's voice. The guide uses suggestions to drive behavioural change towards a desired outcome. In comparison to Jon Kabat-Zinn's definition of traditional non guided mindfulness: "Paying attention in a particular way, on purpose, in the present moment and non-judgementally", Guided Mindfulness, by comparison, requires a guide to lead the experience and the addition of suggestions towards achieving a desired outcome (like stress reduction). This process and practice of guided Mindfulness meditation requires an individual to follow verbal instructions that teach the individual how to relax the entire body, clear the mind, concentrate on breathing, and focus one's awareness and attention internally to move towards a changed state of mind. This state of mind is typically a heightened and focused state of attention, where the individual is very receptive to suggestive instructions. What is chosen to explore when experiencing Guided Mindfulness all depends on the individual's intentions, needs and level of interest. ZenZone utilises Guided Mindfulness meditation as our main tool to drive sub-conscious behavioural change. We believe that the spoken word, in a guided format, is the most effective way to link the logical interpretation of words and language within the conscious mind to the strengths of the sub conscious mind – where beliefs, values, memories, emotions, associations, metaphors, analogies and imagery drive lasting behaviour change. With the addition of a feedback loop, ZenZone is able to determine and deliver these powerful suggestions at an optimal time, which unites the power of the conscious and sub-conscious minds towards your desired outcome. Cognitive Behavioural Therapy (CBT) is a technique which aims to help an individuals to consciously recognise, address and change their dysfunctional emotions, beliefs and behaviours. CBT aims to change the way individuals think about things, challenging their own beliefs and errors in thinking such as overgeneralising, magnifying negatives, minimising positives and catastrophizing. By utilising and embedding more realistic and effective thoughts, emotional distress is decreased and self defeating behaviours are addressed. Additionally, with a more open and mindful approach to life, individuals can develop their own coping skills, emotions and behaviours. CBT has been proven to be an especially effective method to treating depression, stress and anxiety and is also categorised as a gold standard treatment for Irritable Bowel Syndrome in the UK's National Health Service (NHS). Neurofeedback uses a computer to display real-time feedback on an individual's brainwaves onto a screen, which are represented in the format of a game or visual mental challenge. The goal of Neurofeedback is to control the on screen display by adjusting your own brainwaves, through both practice and reward. The greater the individual is able to display the brainwave pattern that is being trained, results in some form of an on screen reward. Ideally, the key aim of Neurofeedback is to help the individual produce lasting positive adjustments to their brainwave patterns. According to practitioners, Neurofeedback has been closely linked to the treatment of attention deficit management and has produced extensive positive results when used in practice. Biofeedback works on a similar principle to Neurofeedback, by monitoring an individual's physiological functions (like heart rate) and driving an on screen feedback system. Again, the objective is intended to help the individual to consciously become aware of bodily function, through visual or auditory feedback and reward, in order to gain greater awareness and lasting control when required. Once the user's state of mind and body is derived based on the bio and neuro data, ZenZone's intelligent content management system drives the delivery of specific visual and audio content, selected for optimal effect. In future versions of ZenZone, by far the most exciting potential feature (which is also covered by our patent) is the delivery of a feedback driven virtual reality experience, for maximum user absorption, engagement and interaction. With the recent excitement around Facebook's acquisition of Oculus Rift, this presents a huge opportunity for ZenZone to establish a leadership role in effective behaviour change using feedback driven virtual reality. ZenZone is a break-through in Brain Training. Using feedback data to drive a media content management system, ZenZone intelligently and automatically combines and leverages the powerful effects of Guided Mindfulness, CBT, Neurofeedback and Biofeedback. The ZenZone app is designed to receive feedback data from your body via sensors, which helps the app to understand what state of mind and body you are in. Using proprietary algorithms, the ZenZone app processes this feedback data to produce a single 'ZenZone Index' (ZZI) value, which is constantly monitored during the session. With the assessment of the ZZI continually producing an indication of your state of mind, the app is able to adjust the visual and auditory experience it delivers to you based on exactly how you are thinking, in order to produce optimal results. By listening to an individual's brainwaves, ZenZone is able to determine when a user is attentive and most receptive to hearing suggestions towards their selected behavioural change.